Bell Tower (西安钟楼) and Drum Tower (西安鼓楼) are located at the heart of Xi’an. The tradition of each city in China from Ming Dynasty and on was to build both, a bell tower and a drum tower. Their basic use was to announce dawn and dusk each day in ancient time, where Bell Tower was used for the first, and Drum Tower for the second purpose. They got their names by the means they used to make announcement, the Bell tower obviously using bells, and the other one drums. 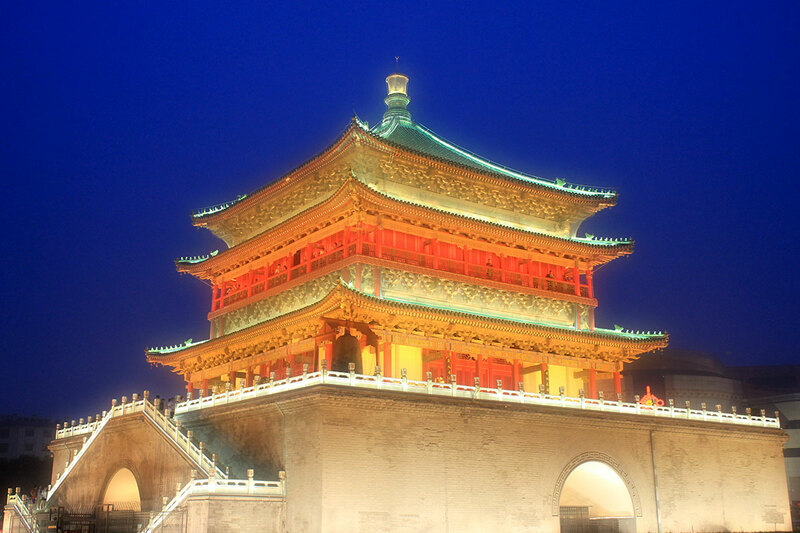 The Bell Tower and Drum Tower in Xi’an also date from the Ming dynasty, and, as it is mostly the case, they are located in the center of the city connecting all the sides within the city wall. The Bell Tower is one of the biggest and best-preserved China, with the height of 36 meters. Being initially built in 1380 during the reign of Emperor Hongwu, it had to be renovated twice in 1699 and 1740. If you manage to go on the top of the Bell Tower, you will get the chance to enjoy the panoramic and serene view of the city. The Drum Tower is 34 meters high and 52.6 meters, and its specific architectural style represents the combination of the styles that were typical for the Tang and Qing Dynasties. But, it also has some new and modern features, and the interesting thing is that there is no iron nail used anywhere in the tower. Its top is also amazing, offering a view of the Muslim Quarter, which is quite specific and interesting. Interesting traditional musical performances are held in both towers; Bell Tower (at 9:00, 10:30, 11:30, 14:30, 16:00 and 17:00), Drum Tower (at 9:00, 10:00, 11:00, 14:30, 15:30 and 16:30). Location: Roundabout at junction of East Street, North Street, West Street, and South street (Bell Tower). Drum Tower is west. Entrance fee: CNY35 for Bell Tower, CNY35 for Drum Tower. CNY50 combined ticketed. Metro/bus: Bell Tower Station on Line 2. Almost every city bus line.